Per Verbal Commits, Mike Wynn has committed to East Carolina. clt says Lebo strikes again. [quote=“Run49er, post:121, topic:30901”]Per Verbal Commits, Mike Wynn has committed to East Carolina. [/quote]I think Wynn will be a good player, but like Mangum’s upside more. This can and will be interpreted in many ways. Don’t think any of them help us at all. i get where you are coming from and i agree but his son does not really look like a scholarship worthy player for us and i imagine he wanted to go somewhere where he was being actively recruited, plus he gets to play with his teammate. I have to think that playing for your dad is a mixed blessing. For him, it is business, but for you, it is your dream. Sometimes the two are at odds. Sometimes the fans can be brutal, and that has to be especially hard for the coach/dad. Good luck Josh. Just don’t turn into an NBA All-Star. Will Dillard also headed to Statesboro. Chose Georgia Southern over his other finalist College of Charleston. Per Verbal Commits, Robert Braswell has been offered by Oklahoma State. In addition to Trey McGowens, we offered Flo Thamba (6’11) and Robert Braswell (6’9) of Team United as well. 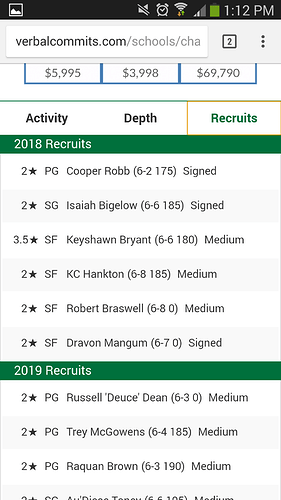 Per Adam Zagoria, Thamba has committed to Baylor. UMass and Murray State latest to offer Braswell. Per Verbal Commits, Qon Murphy has committed to Houston Baptist of the Southland Conference. Sanchize has not extended an offer that we’re aware of yet. 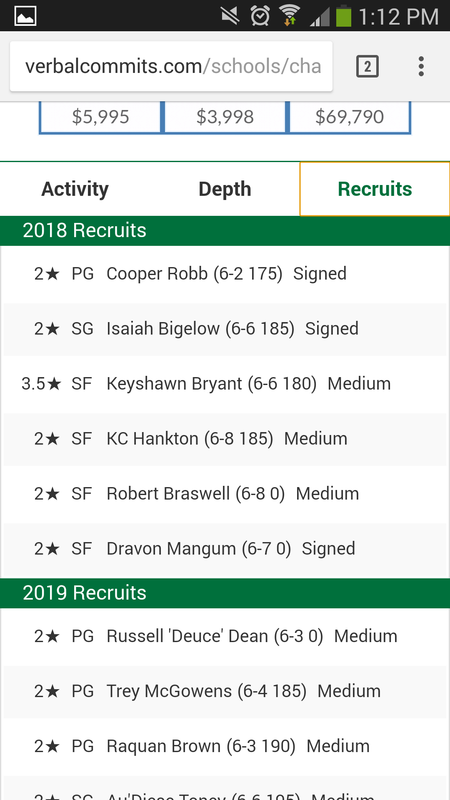 Bryant was a Rivals 150 prospect at one time. They do list that we have offered, but will defer to 2k on what’s current per Coach Sanchez. He may not be a good fit for Sanchez’s system. Sanchez would probably prefer to use the one open scholarship on one of his own recruits if possible. Brewster Academy center @LKisunas has received his release from #UConn & heard from the following schools this week: Arizona; Georgia Tech; UMass; UNC- Charlotte; UNC-Greensboro; Old Dominion; SMU; South Florida; Stanford. Lukas Kisunas is a 6-8, 235-pound Center (BK) from Lithuania. He attends Brewster Academy in Wolfeboro, NH. Now he looks like the kind of inside presence we’ve been lacking for years !